The SMARTPLY OSB2 comprises of cross oriented layers of flakes of selected softwood timber bonded with synthetic resins and waxes. OSB2 is manufactured in accordance with the requirements of I.S. 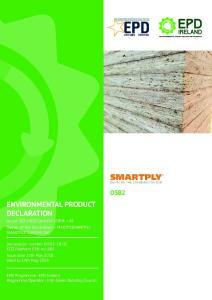 EN 300:2006 Oriented Strand Panels Board (OSB2) – Definitions, classification and specifi cations. The intended use of the SMARTPLY OSB2 panels is in the construction industry in structural and non-structural applications. It is used for structural and non-structural applications in dry condition’s such as furniture, packaging, pallet tops, gardens sheds etc. The average density of the SMARTPLY OSB2 panel is 600 kg/m³.